I’ve noticed more and more that when I try to force an outfit to work, it ends up being a disaster. Anyone else deal with that? It’s the looks that are effortless and uncomplicated that look the most polished, fresh and cool. 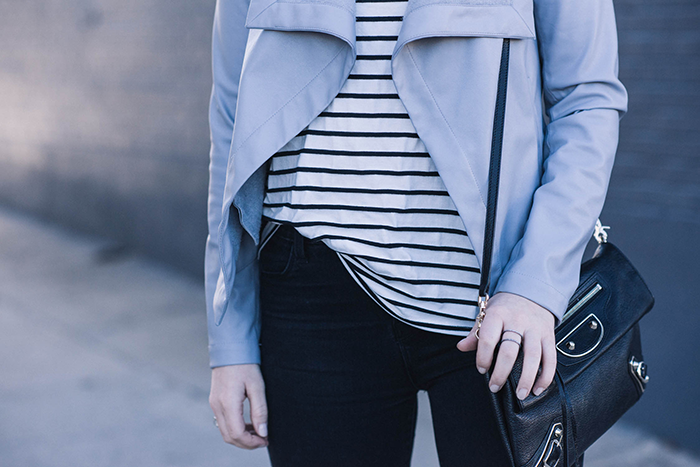 When I bought this pretty blue (faux) leather jacket a couple weeks ago, I tried so hard to make it match other blue things in my closet, and totally failed. I love to match so so much – almost to an obsessive degree. I decided to take it with me on my LA trip last week planning to wear it with something else completely. I still was having trouble with it. That is until Heidi Merrick gave me one of her luxe striped tanks during a visit to her studio! The next day when I was getting ready, it literally took me two minutes to throw this look together. I just need to take a step back and focus on the simple things. Having clean yet elevated pieces like Heidi’s tank (on sale!) or other closet staples like a plain white tee and basic black jeans is essential to making those outfit decisions easier. A couple other striped tanks I’m loving right now include this one by Current/Elliott, and this sale find from Rag & Bone! Definitely going to try to focus my spending on more of those kinds of basics! 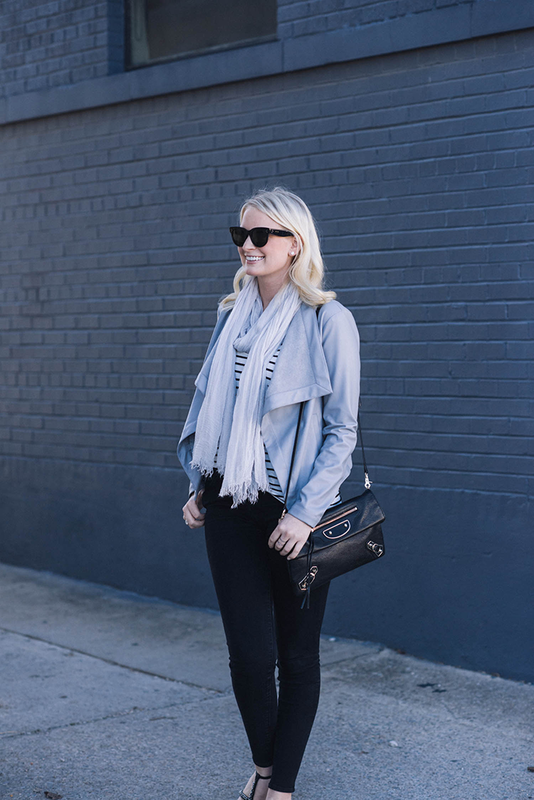 What are the pieces in your closet that you reach for when you need a no-stress look? I love simplicity when it comes to my ensembles.So I totally get what you’re saying. 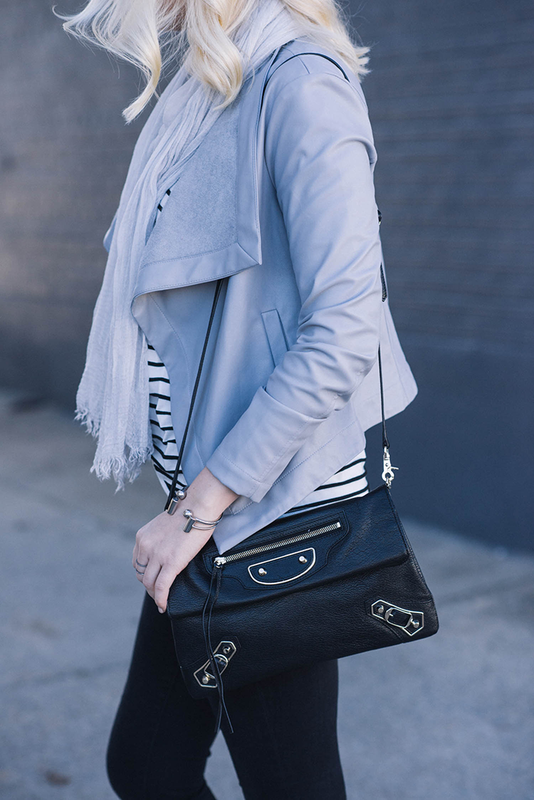 You make me want a grey leather jacket, I love how simple and chic it is!